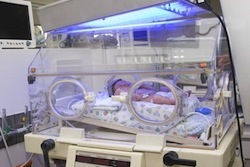 Premature birth is associated with inflammation caused by reproductive tract infection. CO (carbon monoxide) is known to have anti-inflammatory affects. Researchers from various hospitals in New York recently published a report in the American Journal of Reproductive Immunology claiming carbon monoxide may reduce inflammation and thus reduce the impact of the infection. Placenta explants were cultured in a lab with Ureaplasma parvum and E-coli. Some cultures were treated with 250 parts per million of carbon monoxide. The carbon monoxide inhibited growth of E-coli, but it was only effective on some strains of Ureaplasma parvum. Conclusion: Carbon monoxide, in low concentrations, reduced cytokines associated with inflammation and increased the production of cytokines that inhibited inflammation. Researchers believe the results suggest carbon monoxide may be useful in promoting anti-inflammatory cytokines and reducing the impact of infection-based inflammation. Source: Peltier MR, Arita Y, Gurzenda EM, Klimova N, Koo HC, Murthy A, Hanna N. Effect of carbon monoxide on bacteria-stimulated cytokine production by placental explants. Am J Reprod Immunol. 2013 Feb;69(2):142-9. doi: 10.1111/aji.12017. Epub 2012 Sep 13.